Because the AstraLite is hoodless, it is important to pack adequate head insulation. 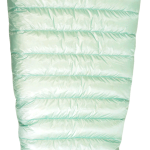 AstraLite users should consider bringing a hooded puffy along if temperatures are likely to dip below freezing. The NanoLite is designed for above freezing so a beanie and neck gaiter will do.